DekTec's USB-2 hardware-based receiver for DVB-T2, T, C2, C and ISDB-T. With full support for single- and multi-PLP, as well as SISO and MISO, this USB-2 probe is perfectly compliant to DVB-T2 v1.3.1. DVB-T2/T/C, ISDB-T and ASI probe for USB-2 with RFXpert. DVB-T2/T/C, ISDB-T and ASI probe for USB-2 with StreamXpert 2.1 stream analyzer software. DVB-T2/T/C, ISDB-T and ASI probe for USB-2 with RFXpert and StreamXpert. Hardware-based demodulation with 0% CPU load. Receiver provides reception status, RF level, demodulation status, MER, BER, L1 parameters and of course, the complete Transport Stream. 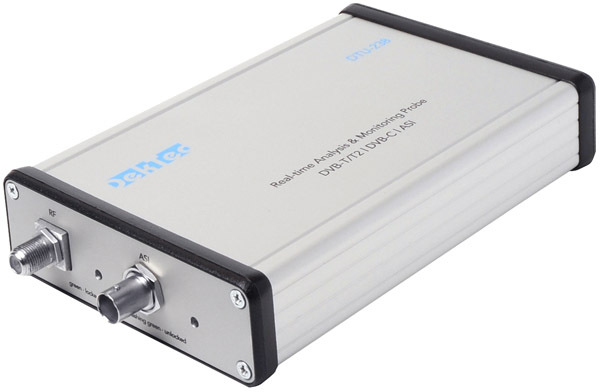 DekTec's portable all-standard all-band modulator for USB-3. The DTU-315 offers, besides UHF/VHF support, also other modulation standards in the L-Band frequency range and an all-digital modulation and upconversion architecture. When using the DTU-236A for receiving modulated signals, the DTU-315 can be the alternative for modulating. DekTec's USB-2 hardware-based analyzer for 8VSB and QAM. Equipped with advanced RF measurement options and designed to operate USB powered, this is a very convenient tool for analysis in the field. If you are looking for a solution that supports 8VSB or QAM only, and also provides you extra RF details, like constellation points, impulse response, a spectrum or transfer functions, let the DTU-236A be your choice.